Great things come in little packages. 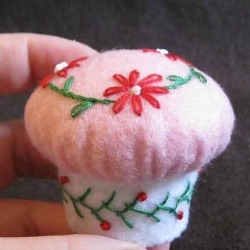 Take for example this adorable Pop Top Pin Cushion from TroubleT. It is a tiny pop top that has been crafted into a useful cushion. Not only have you created the perfect present for your crafty friend, but you also kept a piece of plastic out of the landfills. Look at you saving the planet! You can use this tutorial for any size lid, not just a pop top. They are great for stocking stuffers. Thrifty gift giving doesn’t mean cheap when you get inspired by our Handmade Holiday Gift Guide.